We have been developing film her in our lab since 1984, so we have developed a bunch of film (well over a million rolls), including almost any type of film imaginable. We develop your film with care, but sometimes your pictures may not turn out the way you want or expect. A variety of things can go wrong when selecting, loading and shooting film. Here a few reasons that your film may not have turned out, and some suggestions. You can call or email any questions you may have - we love to talk about film! Blank, clear film, no exposure or frames at all. This is usually caused by improper loading. If the film is not loaded correctly, the camera will not transport the film through the camera, and is never exposed. Make sure the leader is securely placed in the take-up spool. Follow the camera's directions for proper loading technique. Faint images, poor color, grainy pictures. This is underexposure, caused by inadequate light available to expose the film correctly. Make sure the correct film speed setting is selected on the camera, use flash in poorly lit scenes, and keep your subject within the range of your flash. This is caused by the subject or camera moving during the exposure, or by incorrect focus. Try a faster shutter speed, have your subject remain still and use something to steady the camera when needed. Also check your camera for proper focus. Streaks or unexpected light or dark areas on film. The most common cause for this is a light leak or 'fogging', caused by either opening the camera with film loaded or problems with the camera's light seals. The best way to avoid this is to keep the camera closed and check the seals regularly for deterioration. This is double exposure or overlapping pictures on the same film frame, caused by improper film transport. Multiple pictures are taken on the same frame which gives the double exposure look. This is usually caused by using film that is old or has not been stored correctly. To avoid this always use fresh film that is within its expiration date. Also, try to store film in a cool place, ideally in a refrigerator. This is underexposure, caused by inadequate light needed to expose the film properly. Make sure the correct film speed is selected on the camera, use flash in poorly lit scenes, and keep your subject within the range of your flash. 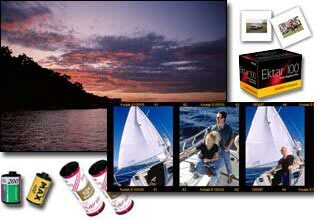 With slide film, exposure is critical as there is less margin for error than with print film. This is overexposure, caused by too much light to expose the film properly. Make sure the correct film speed setting is selected on the camera, and shoot according to the camera's light meter readings. With slide film, exposure is critical as there is less margin for error than with print film, and the light areas of the scene (the highlights) will overexpose or 'blow-out' quickly when the exposure is too much. Streaks or unexpected light areas on film. If you have any questions about how your film processing job turned out, or if you need some helpful hints, please call or email and we will be happy to help! We are proud to offer the finest quality film processing in the country. 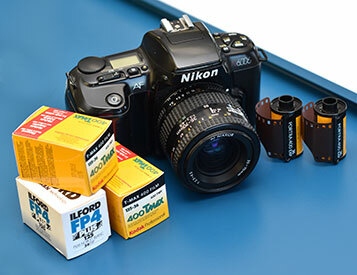 35mm, APS and medium format (120/220) C41 print film processing, printing and scanning. 35mm, medium format (120/220), and 4x5 black and white film processing, printing and scanning. 35mm, medium format (120/220), and 4x5 E6 slide and transparency film processing. Advantix and Nexia (APS) Advanced Photo System film processing and printing. We can develop, print and scan your disposable (single use) cameras. We can process, print and scan your older 110 and 126 film cartridges! Get real lab quality photographic prints from your film. We offer our film developing by mail! - Get an order form here.